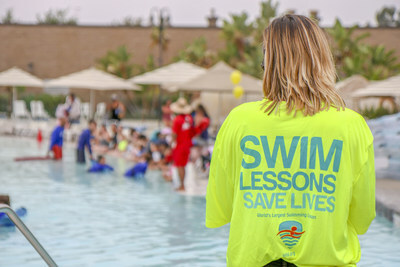 An Estimated 45,000 Children from Twenty-Nine Countries on Six Continents Kick Off First Day of Summer with the World's Largest Swimming Lesson™ (#WLSL) to Combat Childhood Drowning. OVERLAND PARK, Kan., June 22, 2018 /PRNewswire-USNewswire/ -- On Thursday, June 21st, tens of thousands of young swimmers from Boston to Bahrain to Benin, West Africa, all teamed up for the 9th World's Largest Swimming Lesson (#WLSL). The purpose of the event? Provide kids and parents exposure to life-saving water safety skills and build awareness about the critical importance of teaching children to swim to help prevent drowning. B-roll from The World’s Largest Swimming Lesson which took place Thursday, June 21st at 700 locations in 29 countries on six continents. Soundbites from: Olympians Amanda Beard, Rowdy Gaines and Lenny Krayzelburg and instructors and parents participating in the global event aimed at building awareness about the vital importance of teaching children to swim to help prevent drowning. Children and instructors participating, floating, blowing bubbles, kicking/splashing and swimming. An instructor at Splash! La Mirada Waterpark oversees swimmers participating in the 9th Annual World's Largest Swimming Lesson which took place today, June 21st, to kick off the first day of summer. The 24-hour, global event helps spread the message Swimming Lessons Save Lives to families and children in 29 countries on 6 continents. Organizers expect more than 45,000 swimmers. Program organizers are working to connect the dots between the real risk of childhood drowning, the need for basic water competency skills and the fact that parents must remain vigilant at all times when supervising children in and around water. Tragically, childhood drowning remains the second leading cause of unintended death for kids under 14 and more drowning and near-drowning accidents take place in June than any other month. The WLSL event took place over a 24-hour period at more than 700 waterparks, pools, Ys and swim schools in 44 U.S. states and 29 countries around the globe. A list of official WLSL Host Locations, as well as swim safety tips can be found at: http://bit.ly/1pHQqgo. "Research shows participation in formal swimming lessons can reduce the risk of drowning by 88% among children aged 1 to 4," said Amanda Beard, Olympic Gold Medalist, mother and WLSL spokesperson. "Yet many kids don't receive formal swimming or water safety training." "Drowning is preventable," said Lenny Krayzelburg, Olympian and WLSL spokesperson. "And, ensuring every child learns to swim is a powerful step toward prevention. We want families to know the proper precautions to take in and around the water."